The Internet of Things (IOT) is certainly an interesting opportunity for everyone. IOT basically boils down to a world where everyday objects have network connectivity to the internet. This allows them to quickly send and receive data, connecting people in more ways than one can even imagine. It could keep track of your heart rate, turn up and down your house temperature through wireless devices, track arrival of your friends and family through GPS, order food to be delivered, turn on your lights just when you turn the corner coming home from work. 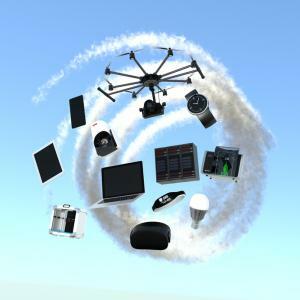 Eventually, all devices may have sensors and become "smart devices." Whether you are ready or not, your life is already connected by data, devices and apps. This is also true for community banking. Here, customers can use mobile banking, make electronic deposits and do wireless transfers. Demands are met seamlessly, with fast and reliable service for all business needs. The world is truly connected globally and community bank customer business growth is occurring well beyond US borders. In fact, it is estimated that more than 70% of the world's purchasing power is outside of the US. In 2013 alone, international trade consisted of 30% of the US economy with a total value of $5T. That is huge and it is a great opportunity for community bank customers and community banks themselves. A quick check in fact will likely surface that many of your customers are already doing business abroad. Still others may become involved globally, as they look for new customers, ways to increase revenue and new ways to grow their business. One of the key banking pipes that connects international activities globally is SWIFT. For over 40Ys, SWIFT has been the premier global provider of secure financial messaging services to over 11,000 financial institutions in more than 200 countries. It has been the gold standard for efficient and secure communication between users when it comes to international transfer messaging. Then, in February of this year, there was a substantial breach and $81mm was stolen from the central bank of Bangladesh. Then, while an investigation was still underway for the February breach, another attack happened in April through an overseas commercial bank. In looking at this issue, SWIFT found like any system, its own is also only as good as the weakest link. These attacks were very sophisticated and coordinated. It appears that in addition to using malware and cyberattacks to access sensitive data within these targeted banks, thieves may have been able to get bank employees to unknowingly provide them with credentials and key information to access funds. Although it is up to individual financial institutions to prevent cyberattacks of all kinds and to ensure employees are properly trained and follow security protocols, these clearly failed here. So, in order to protect against future breaches, SWIFT has taken action along with the banks where the issues originated. It has created a customer security program that it indicates "will clearly define an operational and security baseline that customers must meet to protect the processing and handling of their SWIFT transactions." SWIFT has also moved to improve its products and services with extra protection and detection tools, as well as working with its customers to meet certain baselines. Given a swift and detailed response to the breaches and its commitment to further integrated enhancements, SWIFT's traffic in May 2016 was the best month in history (as 25.59mm messages per day flowed through its system between banks worldwide). Banks worldwide were pleased to see SWIFT take such actions and others in order to further tighten up its cyber world. Doing so has also allowed SWIFT to remain the gold standard system for international transaction messaging. Perhaps in the not too distant future, banks may even leverage the IOT when doing international business. Until then, these security upgrades by SWIFT are welcome news for any bank that has customers doing business outside the US. Yields were flat, as investors digested recent Fed commentary and played a waiting game for jobs data due Friday. On a YOY basis, the FDIC reported industry net income grew 1.4%; net interest income +4.8%; noninterest income +0.9% (trading +25%, servicing -74%); salary and employee benefit expenses +2.8%; loan loss provisions +44.8%; charge offs +13.1%; noncurrent loans -3.4%; noncurrent C&I +8.9%; quarterly dividends -20.9%; total employees +0.1%; number of institutions -4.6%; ROA -3.8%; ROE -4.2%. Meanwhile, YOY loan growth was +2.0%, with loans to non-depository financial institutions +6.9%; credit cards +3.1%, residential mortgages +2.2% and nonfarm nonresidential CRE +2.1%. Liabilities YOY were +5.5%, as deposits +0.8% and FHLB advances +13.4%. A Transamerica survey finds workers by age plan to work in retirement as follows: boomers (50%), Gen X (51%), and millennials (52%). The primary reasons cited across all demographic cohorts are: cannot afford to retire (30%), want the income (25%), want to stay involved (17%), need health benefits (8%). 1) Standard Bank ($485mm, PA) will join with Allegheny Valley Bank of Pittsburgh ($435mm, PA) in a merger of equals (MOE) transaction.